The Global Volcanism Program has no activity reports for West Crater. The Global Volcanism Program has no Weekly Reports available for West Crater. The Global Volcanism Program has no Bulletin Reports available for West Crater. West Crater, a small andesitic lava dome with associated lava flows, is part of a Quaternary volcanic field in southern Washington consisting primarily of small basaltic and basaltic andesite cinder cones and shield volcanoes, oriented along a NW-SE zone to the SE of St. Helens. This 20-km-wide zone extends from Marble Mountain, north of Swift Reservoir, to south of Trout Creek Hill. 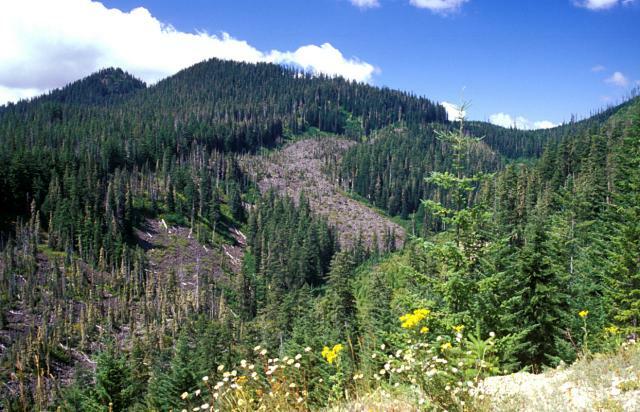 The Pleistocene basaltic Trout Creek Hill shield volcano produced a lava flow about 340,000 years ago that traveled 20 km SE, temporarily damming the Columbia River. At least three vents in this field are of Holocene age: West Crater, a small cone at Hackamore Creek, and a phreatic crater at the summit of Bare Mountain. The latest eruptions at these locations have been dated at about 8,000 years before present, and have included emplacement of an andesitic lava dome and associated lava flow at West Crater and formation of a phreatic explosion crater at Bare Mountain. Barnett B, Korosec M A, 1986. Geothermal exploratory drilling by the State of Washington in 1985. Wash Geol Newsl, 14: 21-28. Hammond P E, Pedersen S A, Hopkins K D, Aiken D, Harle D S, Danes Z F, Konicek D L, Stricklin C R, 1976. Geology and gravimetry of the Quaternary basaltic volcanic field, southern Cascade Range, Washington. In: Proc 2nd United Nations Symp Devel Use Geotherm Resour, San Francisco, Washington D C: U S Government Printing Office, 1: 397-405. Wise W S, 1970. Cenozoic volcanism in the Cascade Mountains of southern Washington. Wash Dept Nat Resour Bull, 60: 1-45. There is no Deformation History data available for West Crater. There is no Emissions History data available for West Crater. 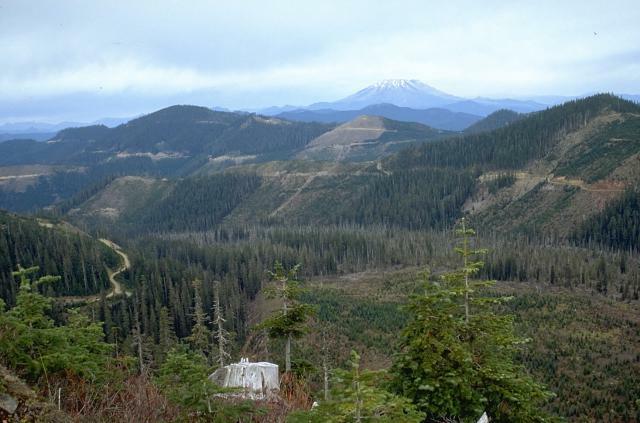 The valley floor in the foreground of this area of extensive logging clearcuts SE of Mount St. Helens, the peak seen in the distance, is covered by lava flows from West Crater and the Hackamore Creek scoria cone just NW of West Crater. Carbon fragments from a black tephra deposit produced by the Hackamore Creek scoria cone were dated at about 8000 years. 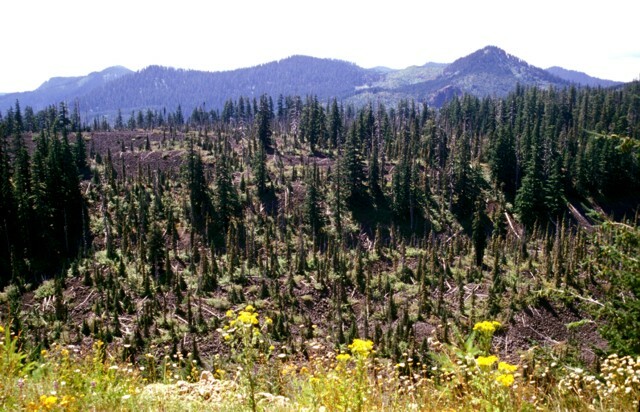 The forest-covered Bare Mountain explosion crater in the foreground is 400-m-wide and 275-m-deep. It formed about 7700 years ago during the youngest volcanic eruption in the West Crater volcanic field. West Crater itself is visible 4 km to the south at the extreme right side of the photo. The Bare Mountain phreatic crater was formed in older Tertiary volcanic rocks, and unlike other Holocene eruptions in the West Crater area, was not accompanied by lava flows. 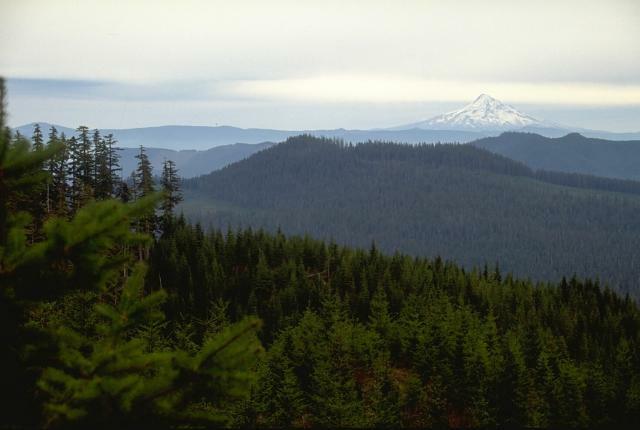 Trout Creek Hill, a small Quaternary shield volcano in the West Crater volcanic field, is seen here from the NW, with Mount Hood across the Columbia River in Oregon in the background. Lava flows from Trout Creek Hill traveled 13 km to the SE, reaching the Columbia River. The large partially forested lava flow in the foreground originated from West Crater, out of view to the right, about 8000 years ago. The blocky andesitic flow, seen here about 2 km from the vent, traveled about 4.5 km to the SE. In addition to this eastern flow, another lava flow traveled to the NW down the Hackamore Creek drainage. 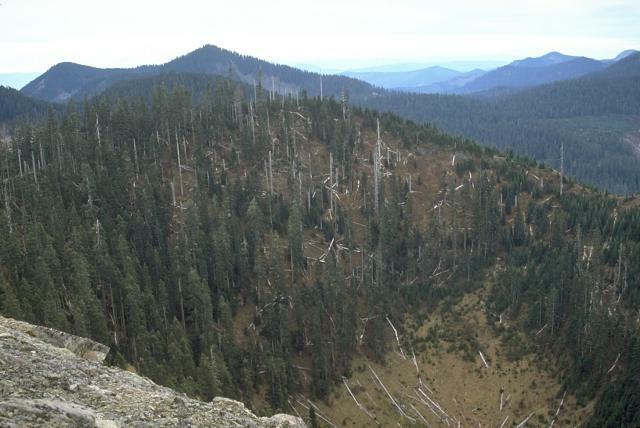 West Crater is a lava dome with a 200-m-wide summit crater that straddles a topographic divide in southern Gifford Pinchot National Forest. West Crater is a little-known Quaternary volcanic field in the southern Cascades of Washington between Mount St. Helens and Mount Hood. West Crater itself, seen here from the NE, is an andesitic dome with two small lava flows, one of which forms the bare area at the right center. The 290-m-high dome was formed about 8060 years ago on the floor of a cirque carved into older Tertiary volcanic rocks. The West Crater volcanic field consists of a series of small shield volcanoes and cinder cones along a NW-SE zone. Large Eruptions of West Crater Information about large Quaternary eruptions (VEI >= 4) is cataloged in the Large Magnitude Explosive Volcanic Eruptions (LaMEVE) database of the Volcano Global Risk Identification and Analysis Project (VOGRIPA).